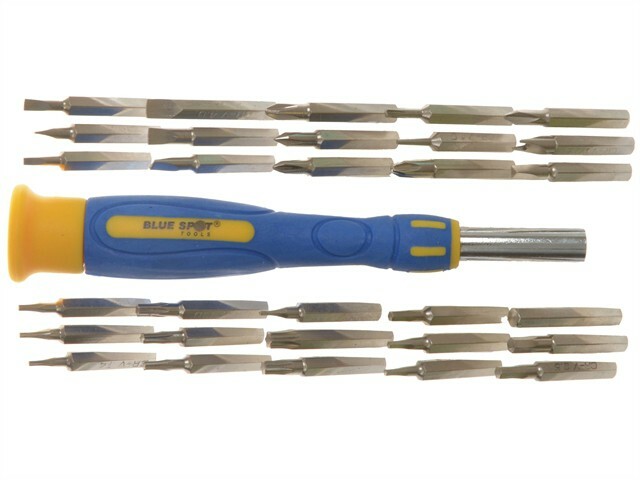 31-piece precision bit driver set. The bits are made from chrome vanadium and have a nickel finish. 1 x Stubby Aluminium Screwdriver Handle. 4 x Phillips Bits: PH00, PH0, PH1, PH2. 1 x Tri-Wing Bit: 3mm. 1 x Triangle Bit: 3mm. 1 x Spanner Bit: 2.6mm. 1 x Star Bit: 2mm. 1 x Point Bit: 1mm. 6 x Slotted Bits: 1.5mm, 2mm, 2.5mm, 3mm, 3.5mm, 4mm. 8 x Torx Bits: TX4, TX5, TX6, TX7, TX8, TX10, TX15 and TX20. 7 x Hex Bits: 1mm, 1.3mm, 1.5mm, 2mm, 2.5mm, 3mm, 4mm.